Mentioned is the way you can write Nuclear Engineering CV Template . 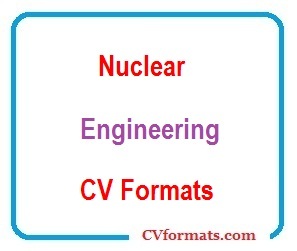 People looking for jobs can easily download these Nuclear Engineering CV formats in editable pdf and MS-Word (.doc) formats or you can just copy and paste from or website CVFormats.com and app. Cover letter of Nuclear Engineering CV Template is also available. Just change the name , address , qualification and experience and your Nuclear Engineering CV Template is ready. Career Objective: To become an efficient nuclear scientist so as to contribute to the field in an effort to make its use more widespread. Ka-Bo Nuclear Research Facility, 2014-Present: working as a researcher and a nuclear scientist, constantly looking at the applications of nuclear power in the medical industry. The job demands long hours and odd timings, but I perform it with utmost dedication. My report on the applications of nuclear power has been published in a leading magazine in France.